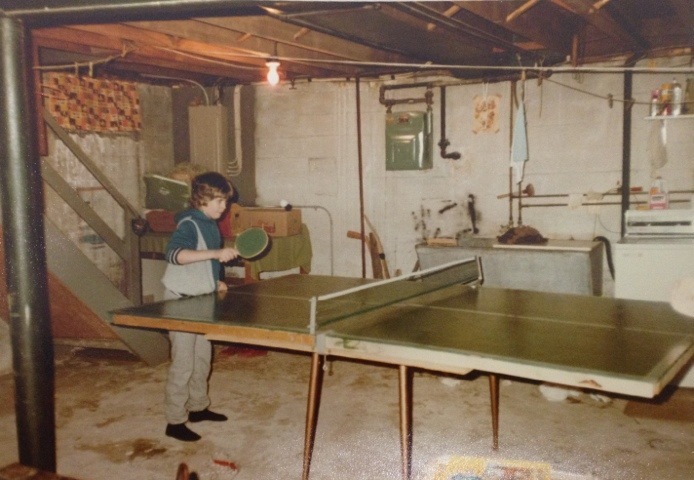 Ping pong in the basement, c. 1983. I can’t say that I had exactly forgotten that we had that janky ping pong table in the basement, but I certainly hadn’t thought about it in a long time. If I remember correctly, we got it from neighbors who were moving and didn’t want to take a semi-broken ping pong table with them. (Note that it doesn’t have proper legs – it’s balanced on a smaller table.) It certainly wasn’t the fanciest, but we did have a lot of fun playing on it. Do you have photos from your past that you’re willing to share – and a blog to post them on? Play along with Wayback Wednesday by linking back to this post or sharing in the comments so we can snoop into your past, too! And, you are so right. The PP top (from Caltas when they moved) is balanced on our old kitchen table and, yes, the old basement looks disgusting! Yep, lots of fun was had there!! I’m actually thinking of getting another PP table for the Grands to have something to do as they get older. Yes/No ???? Wow the basement really does look hideous in that picture. The grands here got a ping-pong table at their house for the grandkids…and it’s been a hit for years….